If they get the chance, dog owners will always go for a Sunday brunch or hang out with friends at places where they can bring their dogs. Smart business owners, also dog owners, recognize this, so dog-friendly bars and restaurants are cropping up all over the country. Most, due to local health regulations, only allow dogs onto their patios and porches. Others, like Mutts Canine Cantina in Dallas or The Watering Bowl in Denver, have spacious dog runs attached to the restaurant’s outdoor space so that dogs can roam to their hearts’ content. And then there are places like Norm's Eatery & Ale House in Seattle, where the dogs are allowed all over the place. Most dog-friendly restaurants even have special dog menus. 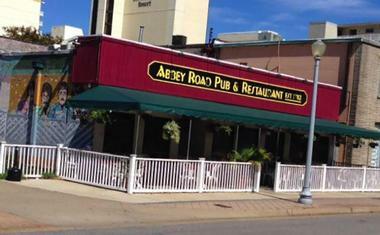 Abbey Road Pub and Restaurant is a spacious, cozy tavern only a block from the beach, with rustic brick walls covered with Beatles photos and memorabilia. A line of flat-screen TVs is there for you to check your favorite game while sampling their incredible assortment of beers from all over the world. This popular Virginia Beach watering hole, which has been around since 1982, offers more than 100 kinds of beer from 80 countries, 42 of them craft. Their delicious food is also cosmopolitan and ranges from Jamaican jerk chicken to shrimp and grits. They have live music on Fridays and Saturdays and a wonderful covered sidewalk patio where you can bring your four-legged best friend. Barking Dog is a popular New York City Upper East Side restaurant where the line for a Sunday brunch goes around the corner. 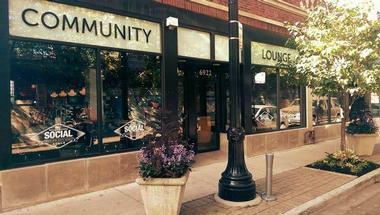 The inside space is unpretentious and homey, with cozy booths and toys as decor. 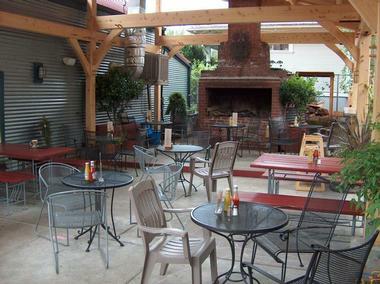 Very family-friendly, Barking Dog has a great kids’ menu and a fountain for the family dog on the lovely outside patio. While the place is famous for their breakfasts and brunches, the lunch and dinner menu is huge, with large fresh salads and everyone’s favorites such as fried calamari made to perfection, breaded in cornmeal and served with saffron aioli and marinara sauce. They make wonderful freshly squeezed juices but also have a full bar. 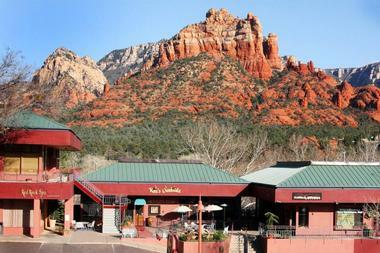 Creekside American Bistro is one of Sedona’s most popular gourmet restaurants, with spectacular views of Sedona’s famous Red Rocks and a menu that will make you forget about the view. Overlooking Oak Creek, the elegant wood-paneled dining room has beautiful light fixtures and a serene vibe, but it is the two outdoor patios, which open to the views, that attract most guests. Chef Mercer Mohr produces memorable meals starting with a breakfast that features such treats as the pork belly breakfast with two eggs, corncakes, coleslaw, apple sauce, and glazed pork belly. The menus change weekly and you can only hope to be there when the chef serves his curried lamb adobo with braised lamb shank, basmati rice, Cotija cheese, and the chef’s spicy adobo with red curry. Creekside has a full bar and is famous for its quirky, imaginative cocktails. Dogs are welcome on both patios. 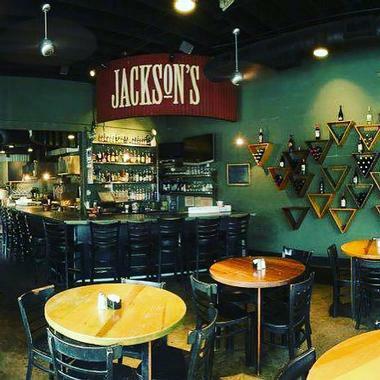 Jackson’s Bar and Bistro, located in Hillsboro Village, close to Vanderbilt University, is a popular, lively eatery where students mix with tourists for great Southern food and fantastic cocktails. 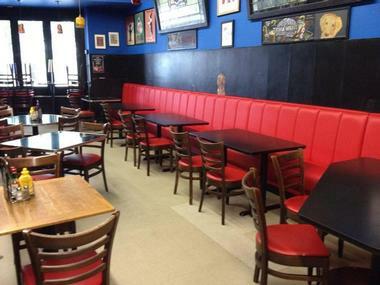 Warm and cozy inside, with small round tables and brightly colored walls, Jackson’s has a large outdoor space where most of the action goes on. Covered and enclosed during bad weather, the patio is great for people watching and for enjoying a drink and a meal with your four-legged buddy. Their Friday, Saturday, and Sunday brunches are legendary and you can expect their famous extra-strong Bloody Mary and, among other Southern delights, Reuben hash with corned beef, peppers, shredded potatoes, sauerkraut, a sunny-side egg, and rye toast with Thousand Island drizzle. 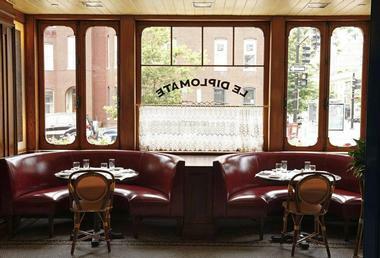 Bright, airy, and bustling, Le Diplomate is a charming, very trendy Washington, D.C., rendition of a Parisian bistro, with a zinc and marble bar, mosaic floors, and a beautiful coffer ceiling. Wicker chairs in the inside dining room and on the lovely outside patio complete the picture. The food is as French as possible on this side of the ocean, with crunchy baguettes, steak tartare with capers and quail eggs and, of course, escargots a la Bourguignonne – snails with parsley-garlic butter and a half baguette for dipping into the delicious soup. 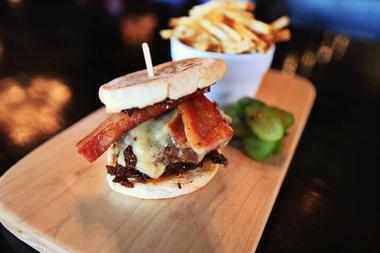 They serve brunch, lunch, and dinner and you had better make early reservation for each. It is the place to see and be seen, but the great food and charming setting are the real reason this place is always packed. Your dog is welcome on the outside patio. 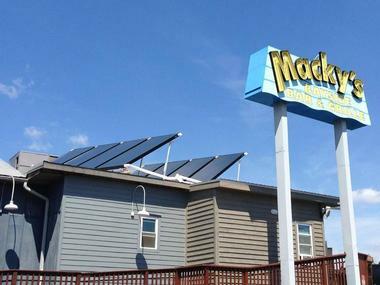 Macky’s is a perfect place to spend a summer evening in Ocean City with family or your four-legged buddy. The large indoor space has a long bar overlooking a line of flat-screen TVs for watching the current game as well as spacious, cozy booths, lots of beachy decor, and original art on the walls. The outdoor space is right on the edge of the bay, where you can sit with your feet in the sand and sip cold drinks with family, friends, and even your dog. The food is delicious, fresh American comfort food with a twist – lobster mac n’ cheese and Kobe beef meatloaf, just to give you an idea of what to expect. Try their fabulous frozen drinks and sample from their full range of cocktails, wine, and beers. There is a DJ on duty at night. 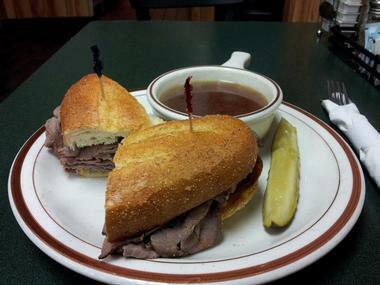 Located in downtown Morristown, New Jersey, Morristown Deli is a popular family-run restaurant and deli that has been serving the city for the last 35 years. The spacious, airy dining room shares the space with a well-stocked deli, so after you enjoy your superb smoked salmon, pastrami, or corned beef sandwich for lunch, you can grab some more for later. This classic Jewish eatery serves breakfast, lunch, and dinner and the menu is large and diverse, offering something for everyone, including the family dog. Pets are welcome on the large outdoor patio, which is always packed on a warm day or evening. Cantina is as good a term as any to describe Mutts Canine Cantina, a popular Uptown Dallas gathering place for people who do not like leaving their pets at home when they go socializing. A combination of a burger shack, beer garden, and dog park, this open-air place is incredibly popular and is buzzing with activity any time of day. There is a small hut with a window where you can order things like hot dogs, tacos, burgers, and delicious bourbon-spiked shakes as well as a great selection of craft beers and affordable wines. The spacious, shady beer garden with cheerful yellow picnic tables is the place to eat, drink, and keep your buddy on a leash. 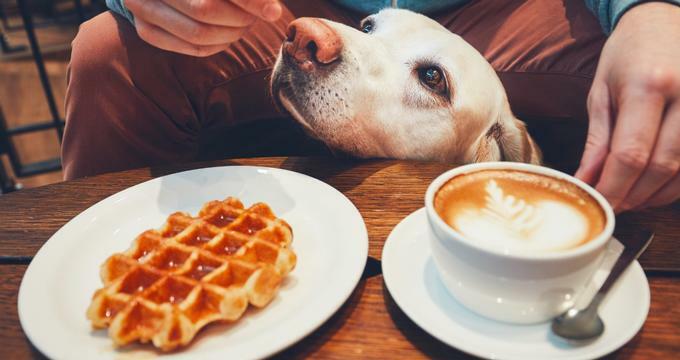 You are free to share your goodies with Fido or pick up something from the doggy menu, such as tiny franks or vanilla custard. Just next to the beer garden is a fenced 2-acre dog park where dogs can run free and socialize. Located in the Seattle’s Fremont neighborhood, Norm's Eatery & Ale House is a popular neighborhood watering hole with great pub grub and a fun dive vibe. The colorful interior decor is clearly dog-centric, with sculptures, photos, paintings, and all sorts of doggy paraphernalia all over the place. Dogs are also all over the place, but if you prefer to be in the fresh air with your pup, there are a few tables outside. The place is busy and popular, partly because people love going out with their dogs, partly because of the great pub grub, and partly because of fun trivia, bingo nights, and other events. OHSO, or Outrageous Homebrewer’s Social Outpost, is a hot spot in the Arcadia neighborhood of Phoenix that serves its own beer and delicious, widely diverse food that includes wasabi calamari, adult sorbet, turkey burger with bacon and pear compote, sweet potato fries, and such delights as mac del mar, which is mac n’ cheese with shrimps. The brewery shares the space with a cozy tap room and restaurant and has two nice patios where you can bring your pooch. You can sit inside in one of the cozy booths or belly up at the bar, but the action is outside on the patio under bright umbrellas. Tours of the production side of OHSO are also available. 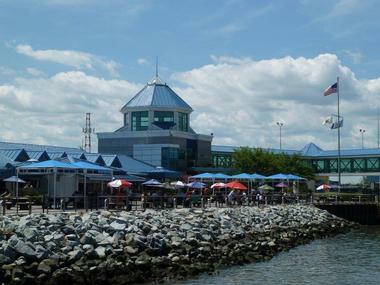 On The Rocks is a Lewes’ dockside bar and grill with the fantastic location and incredible views of Delaware Bay, located right on the ferry dock. It is great place to watch the ferry between Cape May and Lewes as it goes back and forth while you enjoy a delicious meal washed down with a cold brew from their large selection of draft beers, a glass of wine, or a cool cocktail. The menu is small but it changes seasonally and the food is fresh and delicious. The place is large, with a number of tables overlooking the water under the shade of colorful umbrellas, a small bar area, a playground for the kids, and even a small mini-golf course. Dogs are welcome as well. Located right on the lawn of Central Park in Huntington Beach, Park Bench Café is a popular dog-friendly outdoor spot for breakfast and lunch. 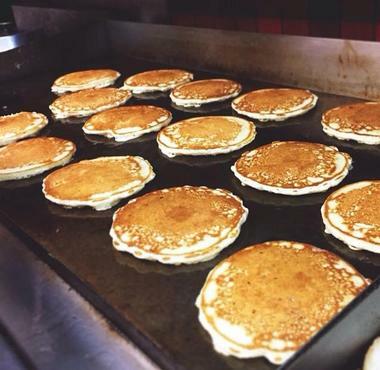 The fairly large menu includes interesting omelets, burgers, sandwiches, salads, and burritos. No alcohol, just coffee, tea, sodas, and juices. 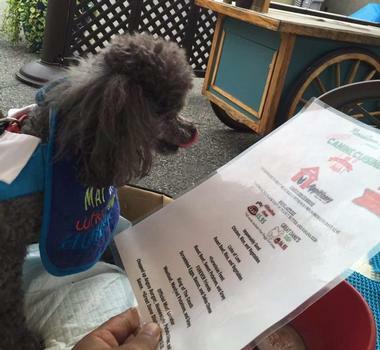 The doggie menu is almost as big as the one for the humans and includes such treats as Hot Diggity Dog – an all-beef hot dog cut up into bite-sized pieces (no bun). Dogs are not allowed to sit at the tables and have to eat from the provided doggy bowls. They get only water to drink. Park Bench gets really lively on special days when one of the dogs has a birthday party. Colorado’s only indoor-outdoor eatery where dogs can share a meal with their owners, Pub Dog Colorado in Colorado Springs is an interesting place with distinct areas: The dog-free restaurant, the indoor eatery where dogs are allowed but the owners have to pick up the food at the counter, a wonderful 1,300-square-foot patio area where guests can hang out and eat with their dogs, and a 3,000-square-foot fully fenced area where dogs are allowed to romp off-leash. The food includes pizzas, nachos, salads, and sandwiches and everything is served in large stainless-steel doggy bowls, whether it is for humans or dogs. The menu item names are all dog-centric and at times cross the line: Delicious nachos are piled high with cheese, chicken, homemade salsa, and avocado but come with the unfortunate name of the Dog Pile. A full bar offers classic and not so classic cocktails, a selection of craft and other beers, and a small list of wines by the glass. Rita’s on the River is one of those places where folks in San Antonio take their out-of-town guests and which tourists have on their lists of must-visit spots. 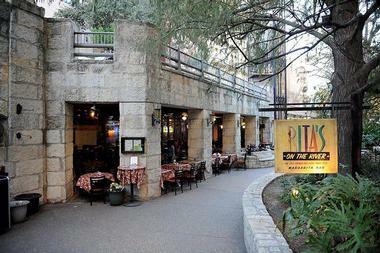 Located on the scenic San Antonio River Walk, in the beautiful Rio Plaza building, Rita’s enjoys wonderful river breezes, lush greenery, and charming outdoor seating by the fountain. The smells of freshly toasted tortillas and grilled meat are part of the welcoming, festive atmosphere, and so are their famous margaritas. You can enjoy your hot fajitas and cold beer while listening to the mariachi band and watching boats floating down the river. Your dog is welcome on the patio as well and at Rita’s they have a special menu just for pups. There is large indoor space for those rare days when the weather in San Antonio does not cooperate. Rogers Park Social Club is a true Chicago’s Rogers Park neighborhood watering hole, actually owned and run by the local residents. The large industrial-chic space has a long bar where your friends and neighbors serve imaginative cocktails and local craft beers. The cozy retro lounge has warm club vibe with comfortable, shabby sofas and armchairs, a perfect place to hang out with neighbors and play a game of Monopoly. The cocktail menu is seasonal and changes with the availability of fresh ingredients. 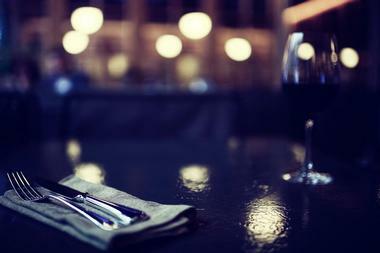 As is the trend these days, many cocktails are a full meal in themselves. You might want to try the Bacon Irish Coffee with Baconated Chicago Distilling Blind Tiger Bourbon, maple, coffee, maple-whipped cream, and maple bacon crumbles. Social welcomes four-legged friends as long as they behave. Located on the edge of the water in downtown Tampa, the Sail Pavilion is great place to stop on your bike ride or hike along the Tampa Riverwalk or while exploring the city’s lively downtown. Overlooking the water and with large umbrellas, Sail is a pleasant spot to cool off on a hot summer’s day with one of their great cocktails, a craft beer, wine, or a fresh juice. 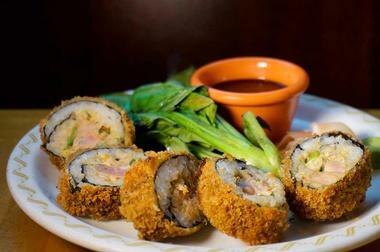 There is a small menu of everyone’s favorite snacks such as nachos, wings, and sandwiches. 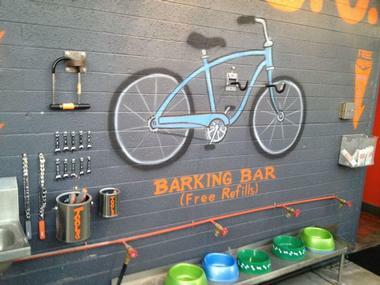 Dogs are welcome and enjoy their own menu and bowls of fresh water. Once a month, on the second Friday, the area serves as a venue for the popular Brews & Bites event – a gathering of the city’s best food trucks and musicians. Spacious, bright, and airy, Sea Glass is an upscale restaurant at the Inn by the Sea resort in Cape Elizabeth with breathtaking views of the ocean as well as fabulous food. This gourmet restaurant offers New American cuisine with Argentinean touches, using fresh local and seasonal ingredients and the daily catch from local fishermen. Chef Andrew Chadwick treats his guests with such delights as lobster tacos with radish, sweet chili, and avocado mousse. Sea Glass has a respectable wine cellar with more than 2,500 bottles from about 400 labels. The restaurant’s lounge offers great cocktails by the fireplace, and the lovely outdoor deck has sweeping views of the ocean and allows dogs on a leash. Sunny Point Café is a tiny family-owned café in West Asheville famous for its menu full of everyone’s comfort food as well as a great outdoor patio where you can get your shrimps and grits and a cold beer under the wide umbrella. Your dog is welcome too. They take the concept of farm to table literally – they have their own on-site garden, so in the season your salad will come straight from the dirt. The menu is fairly large and the good old favorites get a bit of a delicious twist – your trout comes pecan crusted and served with grit cakes, spinach salad drenched in warm bacon dressing, blackened grilled tomatoes, and smoked corn jalapeno tartar sauce. Their brunches are legendary, and the Sunny Point Mega-Mosa and the hot Spicy Bloody Mary are a big reason. 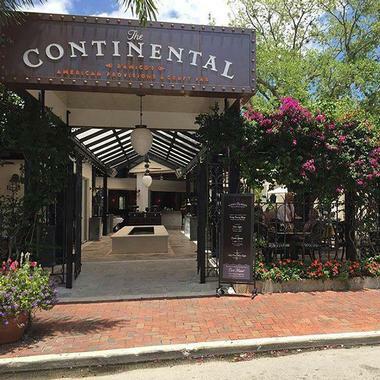 The Continental is an upscale steakhouse and cocktail bar in Naples with a beautiful, elegant indoor dining room and a delightful outdoor terrace smothered in blooming bougainvillea. The menu is focused on steaks, with the finest wagyu, prime, and Piedmontese beef sourced from four nearby farms. The opulent dining room opens to the lovely courtyard and the 30-seat well-stocked bar that mixes classic Prohibition era cocktails. While the steaks rule at The Continental and the menu is full of other upscale items like caviar, fois gras, and steak tartar, you can also get delicious seafood and even a burger. The Continental has a wonderful, well-chosen wine list, and their dessert menu, with nine kinds of pie, is worth leaving some space for. Dogs are welcome on the patio. 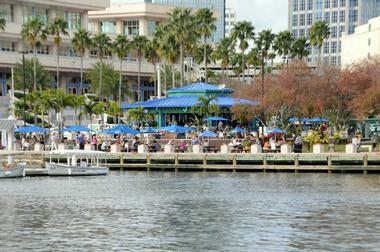 The Continental hosts an annual October Bow Wow Brunch to benefit the Naples Humane Society. 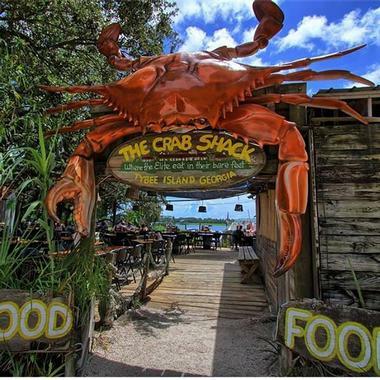 A true seafood lovers’ heaven, the Crab Shack is Tybee Island’s favorite spot for loading on delicious, super-fresh crabs, fish, shrimps, and oysters in the fun, shabby, buzzing atmosphere of a former fish camp. By far the most popular dish is the Low Country Boil, with shrimps, sausage, corn, and potatoes. Most people prefer to sit outside, where they can enjoy the views of the marsh and bring their dogs. If large seafood platters are not your thing, there is authentic Southern barbecue, with ribs, chicken, and pork. The full bar mixes excellent margaritas and offers all sorts of cold beer. There is even an alligator pit with baby alligators for the tourists to see. Located in the NoDa Arts District, the Dog Bar is Charlotte’s favorite watering hole and hangout for those who hate leaving their dogs at home when they go socializing. It is one of the very few places where the dogs are allowed to roam free, both indoors and on the shaded outdoor patio covered with AstroTurf. It can get chaotic, especially if one of the doggy guests is celebrating a birthday. The bar is fully stocked with a range of beers, wine, and hard liquor and the bartender has great fun mixing innovative cocktails. The dog owners pay a membership fee and have to prove that their dog has been vaccinated. 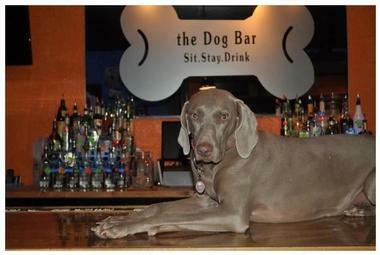 You do not have to have a dog to enjoy the fun atmosphere in the Dog Bar. In fact, it is great place to come and play with dogs if you are thinking of getting one. There are several reasons why the Egg & I is one of the most popular Las Vegas spots for breakfast and lunch. There are their delicious eggs, their large portions, and of course their nice patio where you can bring your dog. Who wants to go out on a Sunday morning and leave the pooch behind? At the Egg & I, you can enjoy your Key Largo crepe or pesto scramble with chicken, feta, and tomatoes while your dog is enjoying the fresh air and the bits of egg you share with them. 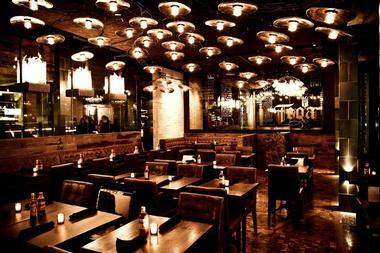 This bright, spacious place on Sahara Avenue is well known to the locals, so don’t be surprised by the crowds. The Morrison is a popular Scottish-themed pub in Los Angeles’ Atwater Village that offers a perfect combo: A great atmosphere with quirky décor, superb gourmet burgers dripping with flavors, and an excellent selection of beers and whiskies. 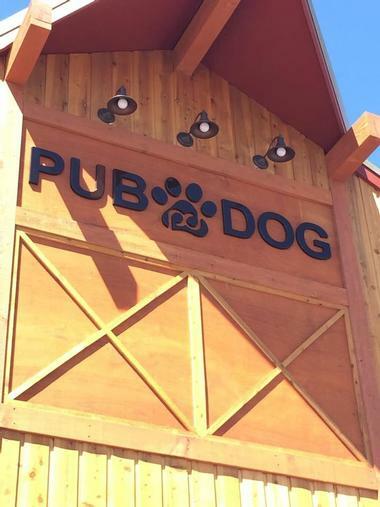 If you thought things cannot get much better than that, they also have a covered patio where you can bring your dog. That makes The Morrison the perfect neighborhood watering hole, where you can hang out with friends, watch a game, test the bartender with some fancy cocktails, and have a great time. 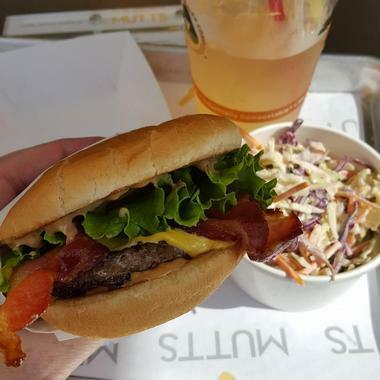 Besides burgers, which you really should try, you can also get regular pub grub such as tacos, nachos, pretzels, and mac n’ cheese. There is a special menu just for dogs. You do not have to own or love dogs to enjoy the Watering Bowl. 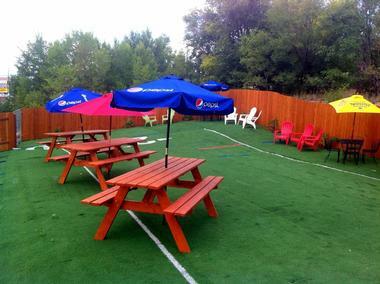 This unique Denver hangout spot combines a fabulous indoor multi-level space with a large bar and all sorts of activities, with a colorful outdoor patio on the lawn and a spacious dog run. Designed to look like a mountain lodge, the Watering Bowl has 14,000 square feet of party/event space where anything happens – from wrestling matches to fancy weddings. There are pool tables, a giant projection screen for the ongoing games, and an endless choice of craft beers and colorful cocktails. For the dog owners, the action is outside. You can sit on one of the comfortable Adirondack chairs or picnic benches and have your burger or nachos with your dog snoozing under the table. Or you can let him romp with other buddies next door in the spacious dog run. Pick up after your dog or the fine will cost you more than your beer. Known for some of the best breakfasts in Portland, Tin Shed Garden Café is a small and delightful eatery that serves healthy fare and has special menus for kids and dogs. Their food is made of organic produce, the eggs come from free-range chickens, the jam is made in-house, and the coffee is locally roasted. It is classic American comfort food made to perfection. The best seats in the house are on the heated covered patio with the large fireplace or, on dry and sunny days, in the lovely garden under colorful umbrellas. Dogs and kids are welcome if well-behaved. The place is popular so be prepared to wait, but they will give you a free coffee.